Andrews finished his rookie season with 34 catches for 552 yards and three touchdowns on 50 targets. Andrews caught both of his targets for 83 yards and a touchdown in Saturday's 22-10 win over the Chargers. Andrews caught two of four targets for 31 yards against the Buccaneers. Analysis: A week after being shut out of the box score, Andrews got back in the mix in the win. The rookie saw his highest target count since before the bye (Week 9) and converted those looks into 31 yards. He'll face a Chargers defense that is strong at limiting opposing tight ends -- 5.6 YPT and four TDs in 14 games -- in Week 16. Andrews was unable to haul in either of his two targets during Sunday's 27-24 loss to Kansas City. Andrews caught all three of his targets for 47 yards during Sunday's 26-16 win over the Falcons. Andrews caught his lone target for a 74-yard gain against the Raiders. Andrews caught his lone target for a 19-yard gain during Sunday's 24-21 win over the Bengals. Andrews caught three of six targets for 50 yards in Sunday's 23-16 loss to Pittsburgh. Analysis: Nick Boyle may be the starter and Hayden Hurst the first-round pick, but Andrews is the tight end Baltimore trusts to take the field on passing downs. The rookie third-round selection enters a Week 10 bye on pace for a 37-434-4 receiving line on 57 targets, while neither Boyle nor Hurst has made much of a dent. 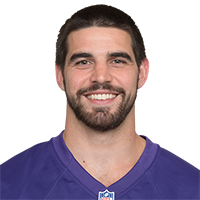 The Ravens may want to find more snaps for Andrews if they use the bye week as an opportunity to make major changes to their stagnant offense. Andrews caught four of five targets for 31 yards during Sunday's 36-21 loss to Carolina. Analysis: The targets and catches both marked career highs for Andrews. 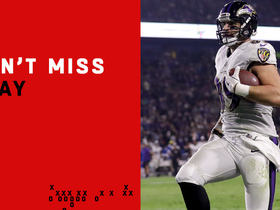 Though he has just two touchdowns at the season's midway point and has topped Sunday's modest yardage total just once, he still looks like the safest bet among Baltimore's four-tight-end rotation -- leading the group in receptions, yards and touchdowns. Next is a Sunday matchup against a Steelers pass defense ranked in the bottom 10 of the league, surrendering 265 yards per game. Andrews had one reception for an eight-yard touchdown against the Saints on Sunday. 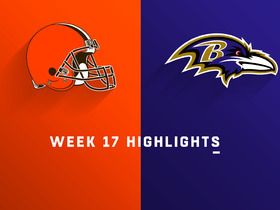 Analysis: Baltimore only targeted tight ends five times on Sunday but Andrews was able to make his only opportunity count as he found the end zone for the second time this season. Andrews was averaging 3.3 targets per game coming into the Saints game, so it's not unreasonable to expect a slight uptick in volume in Week 8 against the Panthers. Andrews caught two of four targets for 20 yards during Sunday's 21-0 win over the Titans. Analysis: In a deep Baltimore tight-end room, the rookie third-round pick is arguably the most intriguing target, leading the crowd with 155 receiving yards and the only receiving touchdown of the bunch through six weeks. He made some big plays a few weeks ago against Denver and takes on a Saints defense Sunday ranked 30th in the league in opponent yardage per reception at 12.7. Andrews caught two of three targets for a career-high 59 yards in Sunday's win over the Broncos. Andrews caught three of four targets for 17 yards and a touchdown in Thursday's loss against the Bengals. Andrews caught three of four targets for 31 yards in Sunday's win over the Bills. Andrews caught each of his three targets for 61 yards in Thursday's preseason win over Washington. Andrews (undisclosed) has returned to practice, Ryan Mink of the Ravens' official site reports. Analysis: This is the third straight practice session in which Andrews has been able to participate, so it looks like he is fully healthy, especially since he's taking full contact. Andrews will be battling for a depth role at tight end this preseason. Andrews (undisclosed) isn't practicing Monday, Jamison Hensley of ESPN.com reports. Andrews didn't practice Thursday due to a muscle tissue injury, Edward Lee of The Baltimore Sun reports. Andrews (undisclosed) returned to practice Friday. Analysis: The rookie third-round pick missed the first practice of training camp with an undisclosed muscle-tissue injury, but it's apparently not a major concern. The quick return should help Andrews in his battle for playing time with first-round pick Hayden Hurst and incumbent starter Nick Boyle. Given that he's the least experienced blocker of the bunch, Andrews is unlikely to get many snaps outside of obvious passing situations. Andrews was not available for Thursday's practice due to a muscle-tissue injury. Analysis: Without a full diagnosis of the injury, it's difficult to estimate when Andrews will return to practice for the Ravens. At this point, it's best to consider him day-to-day until more information about his status is revealed. When healthy, the rookie tight end is expected to engage in a three-way battle with Nick Boyle and fellow rookie Hayden Hurst for playing time at tight end in 2018. Andrews (undisclosed) isn't present for the start of Ravens' training camp, Jamison Hensley of ESPN.com reports. Analysis: Andrews was one of just two surprise absences from practice, as he joined offensive tackle Greg Senat on the sidelines without previously being designated with any sort of injury. However, the exact reasoning behind Andrews' failure to take the field isn't exactly clear at this point in time, so look for additional updates to be provided on the 2018 third-round pick over the coming few days. 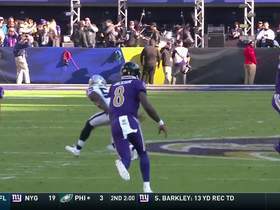 Baltimore Ravens rookie quarterback Lamar Jackson uses his legs to find Mark Andrews for first down. 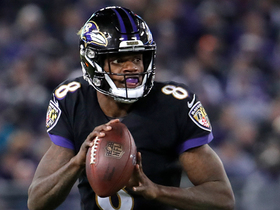 Baltimore Ravens rookie quarterback Lamar Jackson lasers pass to Mark Andrews for 28 yards. 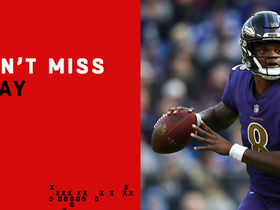 Baltimore Ravens quarterback Lamar Jackson launches a perfect pass to his tight end Mark Andrews for a 68-yard touchdown. 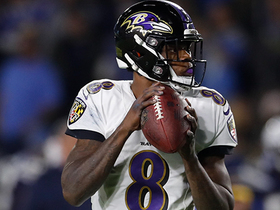 Baltimore Ravens quarterback Lamar Jackson steps into a throw to his tight end Mark Andrews for a first down and gain of 15 yards. 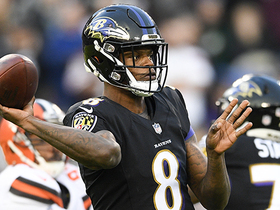 Baltimore Ravens rookie quarterback Lamar Jackson slings a 74-yard pass to tight end Mark Andrews. 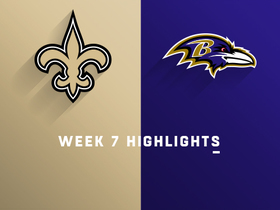 The New Orleans Saints faced off against the Baltimore Ravens in Week 7 of the 2018 NFL season. 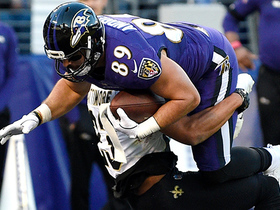 Baltimore Ravens quarterback Joe Flacco hits tight end Mark Andrews for the 8-yard touchdown. 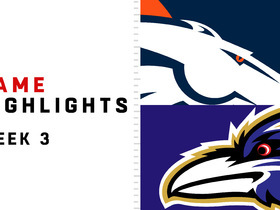 Watch the best plays from the Week 3 matchup between the Denver Broncos and Baltimore Ravens.